Sometimes a filmmaker and a music director develop an instant rapport, which translates into magical tunes. A Gulshan Rai – Rajiv Rai film is always eagerly looked forward to. Rajiv Rai is in many ways the guru of hitech potboilers in Hindi. He shoots this gun-gals-gizmo film on international terrorism with a multitude of cameras. 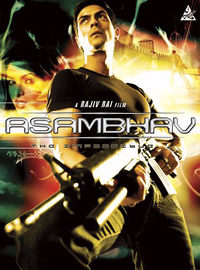 One thought kept niggling me as I watched this Friday's release Asambhav.